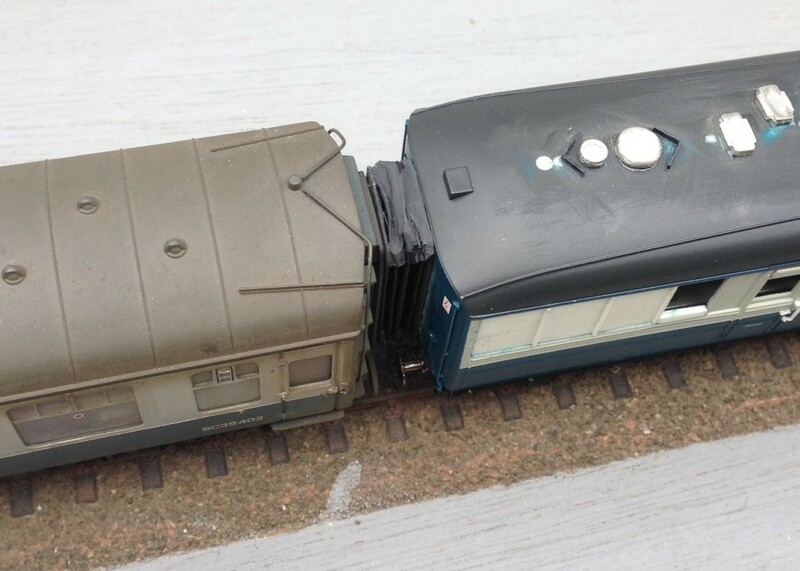 Gresley Buffet – Part 4 Finished! …..but, before it was counted as finished, it needs to be doing the job it was designed for – buffeting. And that means it needs to be populated with people. 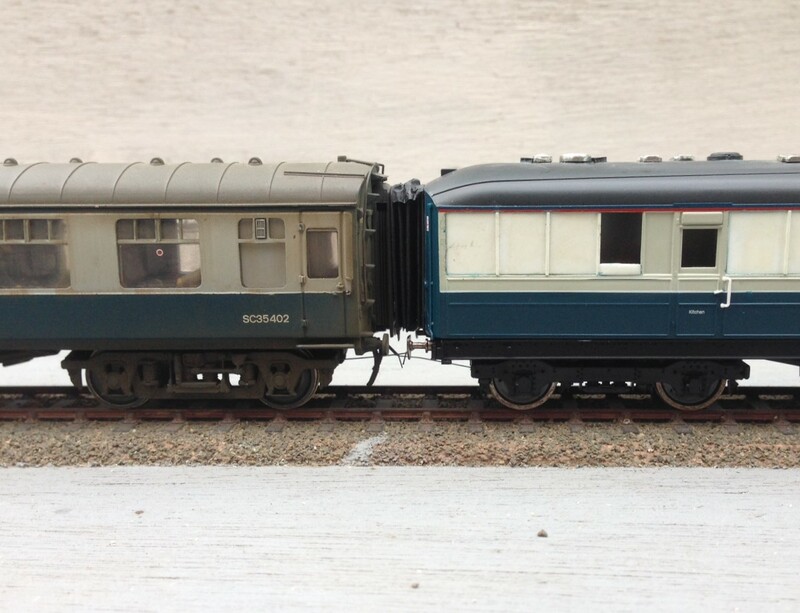 Regrettably few modellers, even finescale modellers, actually put people in thier coaches (and sometimes in contrast to platforms which are stuffed with them!). This is a shame as they do make a difference to even a fairly casual viewer. At a show recently, a dad and his son who were probably not modellers spotted the people in my coaches instantly. I’ll take that as proof of the point! As is common with rtr coaches, the seats are moulded in place such that there is no room for the little peoples legs, so some severe amupation is required! In the case of Hornby’s buffet, the seats are also modelled pushed tightly underneath the tables – which has meant that the backs to the seats or the lip of the table also needs to be hacked away a bit. As all of this surgery occurs below the waistline of the coach, it is not visible from outside so your Dr Crippins’ tendancies will go unnoticed!! Next up was to paint the exterior where the new plastic was cut in and here I had some problems. I was warned by Brian of Shawplan that I should paint the whole side when I repainted the new sections but I decided not to follow this advice – something I now regret!! So having masked up theadjacent areas and sprayed in only the affected sections i found that the grey that Hornby used was notably bluer than that provided by Precision Paints. The first attempt at repainting had the colours sticking out like a sore thumb and even on the second attempt, with a dab of blue in the mix is not perfect but is just ok underneath the grime. So, if you are proposing to do follow this build follow Brian’s advice, not mine! Once a couple of new windows were cut into the reshaped windows in the kitchen area of the buffet car, it was necessary to weather the vehicle. These buffet cars were notorious for being really tatty by the 1970’s; partly because the paint supposedly was prone to debonding from the underlying teak but also because the automatic washers were not good at getting into the corners of the panelling. After an overall spray of dirt to tone down the colours and another to represent the brake dust and track muck, I used two techniques to represent the weathering on the panelling. The first was to spray the whole coach with a mist and once it had started to dry a stiff artist’s brush was dipped in thinners was used to remove the bulk of the paint. The areas that it does not come away from are the nooks and crannies around the panelling; the same areas that would have retained the dirt in the real things. I to find, however, that the margine between where the paint has been removed and not can be a bit stark, so I used a second technique to both hramonise this and also acceptuate the effect. Using a heavily thinned dirty black paint, run a brush over the whole of the sides – the paint runs to the corners and achieves the same effect. It pays to be brave with this as the wetting effect of the thinners makes this initially look much darker until the thinners have dried off. So thanks Hornby for supplying the model in the first place and the inspiration to do some plastic surgery. Whilst this write up may have lasted some months, actually this was quite a quick conversion – the basic surgery on the side was only 4 hours – so why not have a go? I guess that it is pretty difficult for the RTR manufacturer to take a stab decent corridor connections because they have to design for toy train set curves and clumsey hands but it is a weakness of all proprietary coaches. 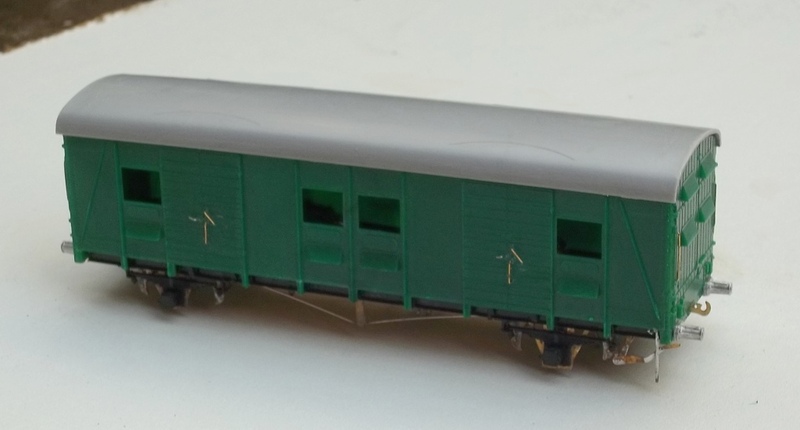 Hornby’s buffet also seems to have overly skinny corridor connections and most noticeable they are mounted too low – they should finish at the meeting of the roof with the ends. Whilst it is possible to simply slice off the connections off and move them up, I chose to remove the and them with some produced by Comet – as this is an LNER vehicle, you need the Pullman type. The core of the operation of the corridor connections are the bellows which are formed with a pair of sheets of fairly stiff paper. 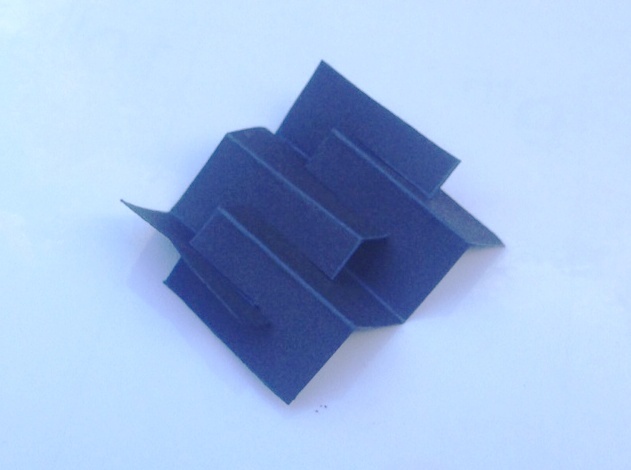 These have slots cut to half their width and are then folded into a concertina shape, with the slot between the folds. Two such pieces are then offered up to each other, with the slots opposing and these then slide over each other as shown in the first picture. To create a concertina bellows like this. Thereafter, the etched end plate is attached to one face. Whilst not provided in the kit, I formed a second plate from plasticard and affixed this to the other end. it is important to ensure that no glue gets on the concertina sections of the paper, as they need to be capable of compressing with minimal effort to correctly operate without derailing the carriage. This is how Comet envisage that the completed connection should look like but I felt that the bellows did not look very realistic, especially from above where the crossing point is all too obvious. In practise, the top of these connections had a fabric roof and applying this dramatically improves the appearance of the connection and has the added advantage of providing some control to the operation of the connections which do tend to expand out and look rather flabby! I dealt with this by putting the rain hood on the top of the connection, which is afterall prototypical (and makes a huge difference to the appearance as you can see). I did this in a manner that meant it acted as a restraint to the movement of the connection. I acheived this by only gluing it at the very back and front of the connection, so that the bellows could move unimpeeded but once they had moved to the required extent, the rain hood pulled tight and stopped them going any further. I found that doing this at the top was not sufficient as their movement continued at the bottom and they took on rather drunken appearance – however, this was solved by simply repeating this at the bottom. I think that I have still allowed the connections to be too big and if there were two together this would definitely be true but next to a rather skinny Bachmann corridor connection, I think they look pretty good (and a big improvement on the originals). Portchullin is in the press! Rail Express have for many years included a modelling section to what is otherwise a prototype magazine. This year (and going forward in future years I beleive), they are producing a yearbook which is dedicated to only modelling features. 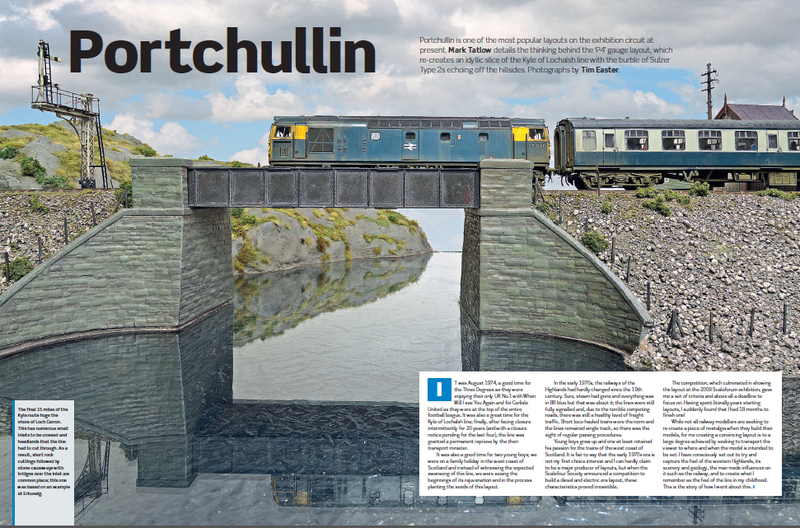 Portchullin is the leading article with a series of photos from Tim Easter – and it is no less than 13 pages long. Slightly prompted by a comment on an early post, I have completed a BR (S) utility van; which I think British Rail called NQVs. This was made from a Parkside kit, with a chassis from Masokits. The former were so simple that you hardly need instructions but the other was less so and it was a bit of a pain to find that it came with only quite limited instructions – I wonder if I did not get the full pack as Masokits are normally fairly good? The other things that I changed with it were to avoid the use of the really grotty buffers from Parkside and used some very good Lanarkshire Models buffers – but I have managed to break a drill bit on one, so I may be stuck with one end being unsprung. I also changed the rather poor handrails over for 0.45mm wire. I have not done the rainstrips yet, but looking at this picture I am going to have too! It should be done for Warley, which is Portchullin’s next outing. Trying to plan ahead a bit more than normal, I am just sorting out van bookings and the like for Portchullin’s next outing, which will be Warley on the 23 & 24th November. We will be running the 1970s both days and there will be a few tweaks to the layout (a full set of working signals for one – our last troublesome one is getting a firm talking to at the moment!). Stop by and say hello if you are going. We will also run the videos as usual. I have just come across my fav one of these on Youtube. This is The Line to Skye; which is firmly the inspiration of the layout. This film was commissioned by Ross & Cromarty Council’s campaign to try and save the line in 1973/74. It is firmly nostalgic and more than a little poetic in its content and style; which frankly makes it even better in my mind. Anyway, as they say – you don’t just arrive at magic; you have to conjure it………………….enjoy! My suggestion is to look at the youtube link soonish; I had to ask and get permission for the showing of this video and I sort of think that the poster on youtube might not have done……………………..
After this, it will be Wigan in June an unconfirmed invite for Hartlepool in July and then Warley way off in November.